I fell in love with this outdoor setting the moment I saw it. I love colors! Maybe because I am basically a happy person with an outgoing and carefree personality (lol). I am so in love with this design that I almost thought of making one at home. But what keeps me thinking twice? It's the long rainy season in the Philippines! How could I afford to see such a beautiful outdoor room submerged in waters. :) Kidding aside, this design can easily be achieved using the already available resources at home. 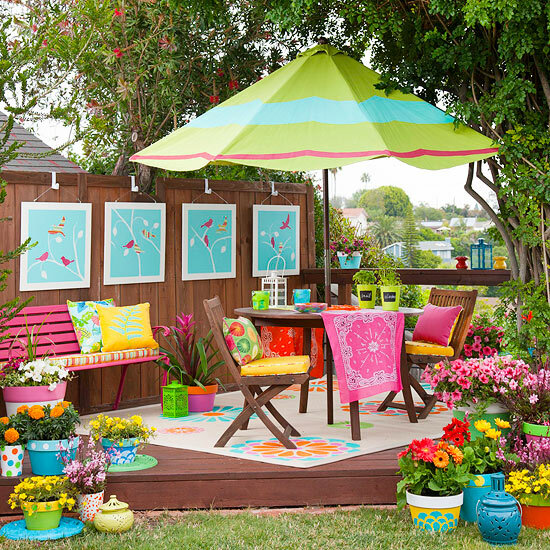 I'm sure you have a garden set at home and whether it's made of steel, plastic or wood, it doesn't matter as long as it will be painted with color that would complement your overall design. I'm pretty sure you have pretty flower pots around your yard, too. Start painting those pots with colorful designs. You can even involve your kids in this project. Another idea, to make your wall decors withstand the changing weather conditions, you may want to use large tiles and paint it with your preferred design, or rather you may want to create abstract paintings. Colorful fabrics can also do wonders. I'm sure that this playful design will bring out your youthful energy.